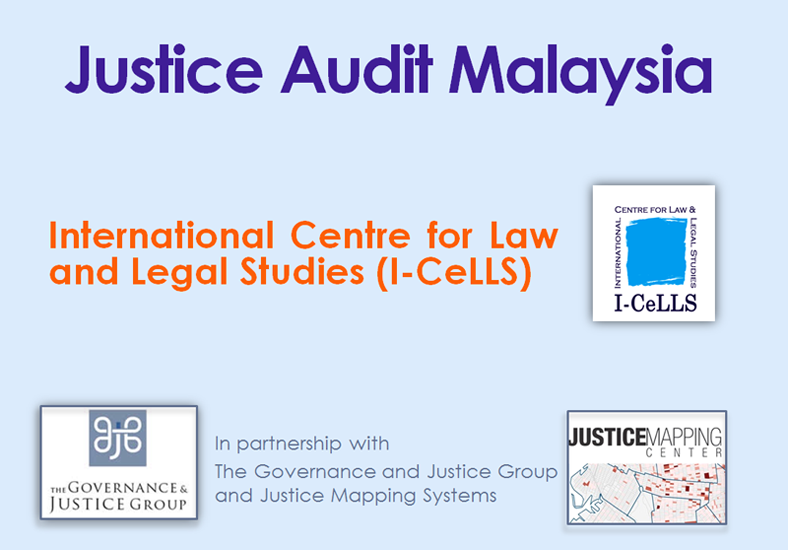 In December 2011, the International Centre for Law and Legal Studies (I-CeLLS) and the Governance and Justice Group (GJG) joined together at the invitation of the government of Malaysia to conduct a Justice Audit of the criminal justice system in Malaysia. i) A spectrum of data on the criminal justice system (justice agencies and service providers) in a given country organized into an updatable database with benchmark information displayed through a graphical user interface (GUI), including geographical information system (GIS) mapping, which also serves as a template for potential expansion to display additional years’ data. ii) A ‘snapshot’ of the criminal justice system in the country illustrating how the process works, the points of pressure and challenges it faces and options for improvements based on good practices. In short, it is intended to be a living tool that creates a central resource for governments, justice service providers, civil society and external partners. The JA is not a one-off assessment - there are a plethora of tools available in the international arena to conduct in-depths assessments of individual institutions. The JA considers the whole justice system as a chain of interlinked and overlapping services. As such its added value is that it mirrors the dynamic process of justice reform and should be updated at regular intervals. The JA is not a measuring stick, or index of performance, against which a country may be judged. Emphasis is placed throughout the JA on a collaborative venture between state actors, practitioners and civil society. At the beginning of each JA, a small group of national stakeholders is formed to act as a ‘sounding board’ for the team at each stage of the JA to build trust, ensure accuracy and promote acceptance of the process. In Malaysia, the GJG entered into such a partnership with I-CeLLS. The Terms of Reference are attached and set out the six stages followed in the execution of the JA. The JA did not include any consideration of Syariah or Native Courts as they operate in Malaysia, the focus was exclusively on the legal system based on the English common law. All the justice institutions co-operated fully in the JA, save for the police department. The key results of the desk review are set out for each institution in the Source Documents on the web application. the JA took placed between 22 January-9 February 2012. The audit team collected data, conducted interviews, visits and observations in Malaysia visiting courts and prisons in Penang, KL, Sabah and Melaka. A draft web-application mapping the justice system was submitted to I-CeLLS by Justice Mapping Systems on 2 July 2012. A presentation was made to the I-CeLLS Executive Committee on 1 August 2012. The JA provides data as of 31 December 2011. Figures for the police department could not be updated or validated and date back to 2009. The audit team was unable to triangulate systematically the data gathered, ie to compare the raw data with perceptions from justice actors (judges, lawyers, prison, police, probation officers) and with perceptions of how the system worked with users of the system and members of the general public due to budget constraints. The views of justice practitioners were sought at random during site visits (ie at courts and prisons). The co-operation of prison authorities, allowed the team to undertake a structured line of questioning with prisoners where the team chose to speak to prisoners in groups in the company of prison officers since the focus of the audit was on the legal process and not on prison conditions. The disaggregation of data is not consistent across the justice system. Prisons muster a depth of detail which other institutions do not always. Aside from research conducted by the Universiti Sains Malaysia for instance, it was not apparent how crime rates varied across the country from state to state. The data gathered did not appear to differentiate between men and women, save for the prisons and, to some extent, the Probation department and juvenile justice. It is hoped that the way in which the available data is organized in this Justice Audit illustrates the value of data collection for the purposes of both planning and reform. I-CeLLS and the GJG wish to thank the various justice institutions and officers who participated in the audit. It was a remarkable feature of the audit how court administrators, members of the judiciary, lawyers in private practice and in the Legal Aid Department, prosecutors, probation and prison officers went out of their way and beyond the call of duty to facilitate the team’s work. The professionalism of these individuals was apparent in the way they followed up requests for data and further information - particular acknowledgement is owed to the statistics unit in the Federal Court and the prisons department in this regard. Furthermore, the level of transparency was impressive: during all prison visits, the team was permitted to speak to any prisoner in groups or individually with or without the presence of a prison officer.